Taste is an important sensory process which facilitates attraction to beneficial substances and avoidance of toxic substances. This protocol describes a simple ingestion assay for determining Drosophila gustatory preference for a given chemical compound. Bantel, A. P., Tessier, C. R. Taste Preference Assay for Adult Drosophila. J. Vis. Exp. (115), e54403, doi:10.3791/54403 (2016). Olfactory and gustatory perception of the environment is vital for animal survival. The most obvious application of these chemosenses is to be able to distinguish good food sources from potentially dangerous food sources. Gustation requires physical contact with a chemical compound which is able to signal through taste receptors that are expressed on the surface of neurons. In insects, these gustatory neurons can be located across the animal's body allowing taste to play an important role in many different behaviors. Insects typically prefer compounds containing sugars, while compounds that are considered bitter tasting are avoided. Given the basic biological importance of taste, there is intense interest in understanding the molecular mechanisms underlying this sensory modality. We describe an adult Drosophila taste assay which reflects the preference of the animals for a given tastant compound. This assay may be applied to animals of any genetic background to examine the taste preference for a desired soluble compound. Animals use chemosensation to distinguish advantageous conditions apart from disadvantageous conditions. This perception can be critical for such things as determining the best food source, avoiding toxic substances or determining the best mating partner1. Chemosensation is often divided into two sensory components: olfactory senses and gustatory senses. A main distinguishing characteristic of these senses is that olfaction (smell) is used to sample the surrounding gaseous chemical environment while gustation (taste) requires physical contact with a nonvolatile substrate. Both sensory modalities stimulate neurological responses which are processed and decoded in the brain to produce the appropriate attractive or repulsive behavior2. These senses are therefore critical for animal survival. The fruit fly Drosophila melanogaster is a model organism which continues to grow in popularity for use in understanding how insects perceive smell and taste. Fruit flies offer tremendous advantages over other model systems due to the wealth of genetic tools available for the dissection of molecular, cellular, and behavioral pathways. Work over the last 15 years has been particularly instrumental in characterizing the specific cellular identities, neuronal receptors, and signaling mechanisms involved in both smell and taste. Now, the power of Drosophila genetics is being used to further elucidate how these processes are coded at the single neuron and single circuit level3-6. Therefore, assays which provide easily scored readouts of alterations to sensory pathways are vital to the continuing advance of these fields. While a great deal is known about how olfactory signals are coded and processed in the brain, much less is understood about similar mechanisms in the gustatory pathway. We describe here a protocol which can be used to ascertain taste preference in Drosophila. Drosophila, like mammals, generally prefer sweet tasting compounds as opposed to bitter tasting compounds. Any combination of these food sources can be utilized in this experimental design to determine how known genetic alterations affect taste choice. In addition, pharmacological intervention strategies can similarly be assessed for their effects on animals' taste preference. The ease and flexibility of this assay makes it a useful paradigm for understanding the nature of gustatory perception in Drosophila. Prepare fly starvation vials by saturating a cotton ball with 18.2 MΩ water at the bottom of a standard fly vial. Alternatively, similarly saturate a small strip of filter paper with 18.2 MΩ water and place at an angle within the vial. Collect flies into sets of ~100 animals on a CO2 pad and then add the flies to a prepared vial. Note: Best results are obtained with animals that are less than 5 days old. However, the exact age of the animals can be controlled as an experimental variable to determine changes in taste preference over time. Use a cotton ball or foam stopper to secure the vials closed. Place vials on their side in an environmentally controlled incubator. Maintain the temperature at 25 °C, and the humidity above 70%. Leave vials untouched for 24 hr. Prepare all tastants for the assay on the same day as testing. Note: The exact tastants to be used will vary depending on experimental question being asked. The following are example tastants used in this protocol. See section 4 for optimizations. Prepare control tastant (1 mM sucrose) by combining 10 µl of 100 mM sucrose solution, 13 µl of red food coloring, and 977 µl of 18.2 MΩ water. Prepare experimental tastant (5 mM sucrose) by combining 50 µl of 100 mM sucrose solution, 10 µl of blue food coloring, and 940 µl of 18.2 MΩ water. Place three 10 µl drops of control tastant nearest the edge of the plate at 12 o'clock and another 3 drops at 6 o'clock. Ensure that the spacing between drops is similar. Place three 10 µl drops of experimental tastant nearest the edge of the plate at 3 o'clock and another 3 drops at 9 o'clock. Ensure that the spacing between drops is similar. Repeat steps 2.2.1 and 2.2.2 for as many replicates as desired. Empty 1 vial of ~100 starved flies onto a CO2 pad just long enough to anesthetize all animals (approximately 10 sec). Brush the animals into the middle of a prepared assay chamber and cover with the dish lid. Note: Longer periods of CO2 exposure should be avoided to improve recovery time and limit interference with the feeding behavior. Exposure to ice (~5 min) may be used for anesthetizing to avoid CO2 behavioral effects that may arise from even limited exposure. Place the assay chamber in an opaque cardboard box. Be sure to label the outside of the box with the condition and genotype being tested. Place the entire setup (assay chamber contained within cardboard box from step 2.4) into a 25 °C incubator with at least 70% humidity for 2 hr. Repeat steps 2.3 through 2.5 for all replicates. After 2 hours, place the assay chambers, still contained within cardboard boxes, directly into a -20 °C freezer until ready for quantitation. Allow a single assay chamber to warm up to room temperature (approximately 5 min). Under a dissection microscope, using a brush or pair of forceps, group animals based on the color of their abdomen: red, blue, purple or clear (Figure 1). Record the number of animals in each grouping. Consider clear animals to have not participated in the assay and therefore do not include them in any calculations. If the experimental tastant of interest is added to the red dye, then use (Nred +0.5Npurple)/(Nred +Nblue + Npurple). If the experimental tastant is added to the blue dye, then adjust the equation to (Nblue +0.5Npurple)/(Nblue +Nred + Npurple). Repeat the calculations for all experimental conditions and replicates. Prepare 4 tastants using the same base compound (e.g. 5 mM sucrose) as indicated in step 2.1, but omit the food coloring. Add 1.3% red food coloring to one of the tastants. Make the remaining 3 tastants with blue food coloring of varying concentrations in each tube (e.g. 0.6%, 1%, and 1.3%). Complete protocol steps 2.2 through 3.4 for each tastant pair: 1.3% red vs. 0.6% blue; 1.3% red vs. 1% blue and 1.3% red vs. 1.3% blue. Repeat step 4.1.1-4.1.3 with different percentages of blue food coloring until the preference index averages a value of 0 (Figure 2). Note: As a starting point, 1.3% red food coloring coupled with 1% blue food coloring typically yields good results. If no satisfactory concentration of blue food coloring can be matched to 1.3% dye, then step 4.1.1 through 4.1.3 can be repeated with varying concentrations of red coloring and a constant concentration of blue food coloring. Analyze all conditions to be tested with the same optimized food coloring concentrations. Some typical results from taste preference assays are shown below. In most experiments some variation in intensity of abdominal coloring will be seen (Figure 1). Any coloring in the abdomen whether intense or weak is considered a positive ingestion. It is therefore advisable for researchers to score animals while blind to the experimental condition so as to limit any potential biases. It is also important to choose concentrations of food dyes which do not affect the outcome of the preference assay. An example of the consequences of using various food coloring concentrations is shown in Figure 2. In this example, the quantity of red food dye was maintained at 1.3% while the amount of blue food dye was varied: 0.6%, 1%, and 1.3%. Each dye was added to 5 mM sucrose to ensure a high percentage of participants in the assay. The taste preference assay was then performed on 3 replicates from each condition and the preference index calculated according to the equation in 3.4.1. 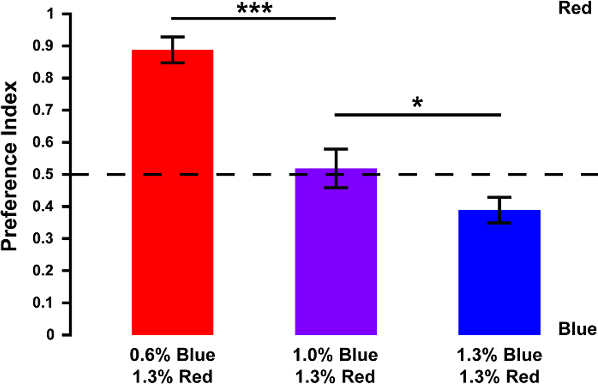 One percent blue dye coupled with 1.3% red dye was found to be optimal for these experiments as demonstrated by the failure of animals to choose sucrose present in one color over the other (preference index value close to 0.5). 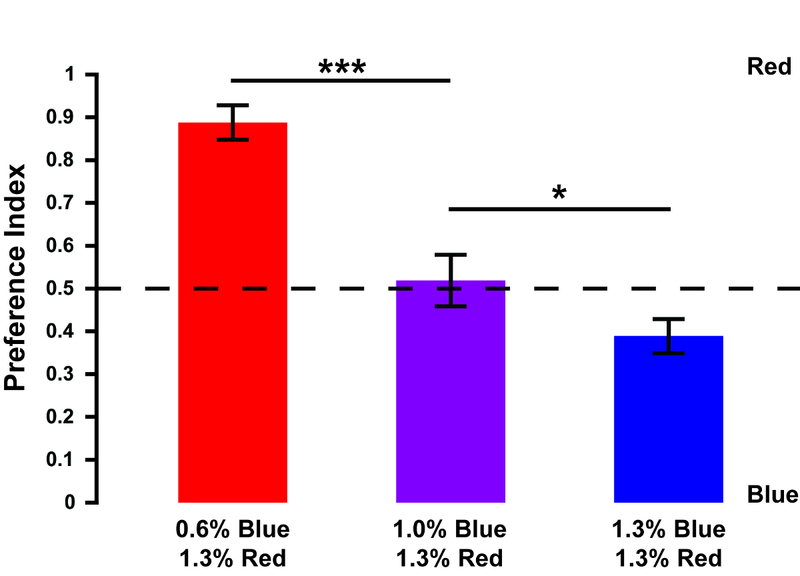 When only 0.6% blue dye was paired with 1.3% red dye, animals clearly chose the red dye sucrose samples (preference index value near to 1), even though the sucrose concentration was identical for both colors. Using equal amounts of food dye resulted in a slight, though statistically significant, preference for sucrose samples containing blue dye (preference index value <0.5). The optimal values identified here were found to give consistent results over a 10 fold range of sucrose concentrations ranging from 1 mM to 10 mM. Nevertheless, the quantities identified here should be considered starting values and actual concentrations should be calculated empirically for all conditions to be tested prior to running experimental samples. The choice of which equation to use for calculating the preference index is based on the setup of the experiment and the attraction versus aversion goals of the experiment. As shown in the example in Figure 3, flies demonstrated a preference for high concentrations of sucrose versus lower concentrations and this preference can be reversed with the addition of acid. The equation (Nblue +0.5Npurple)/(Nblue +Nred + Npurple ) from 3.4.2 was used to calculate the preference index for 3 replicates of each experimental condition since the compound of interest was placed in the blue dye. A preference index near 1 indicates that when offered the choice between 1 mM sucrose (in red) and 5 mM sucrose (in blue), the flies nearly always chose the higher concentration. 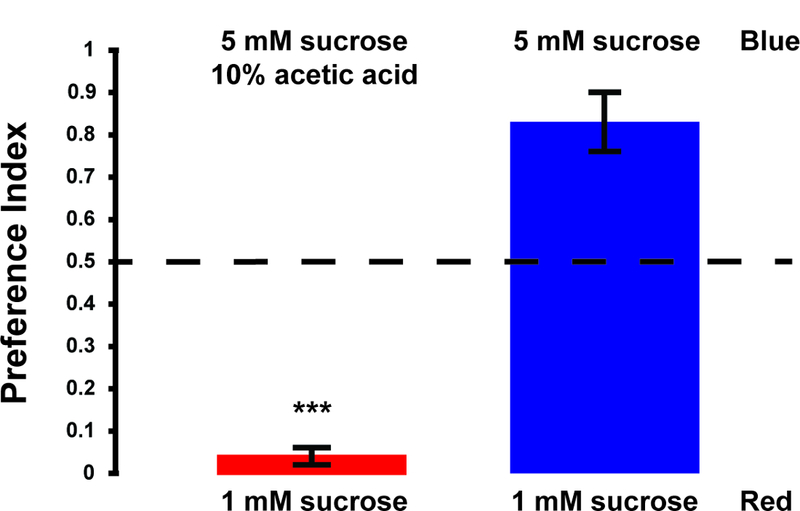 Conversely, a second grouping of flies was given the same options except that 10% acetic acid was combined with the 5 mM sucrose option (in blue). Flies nearly completely avoided this situation as seen with the preference index near 0, consistent with known responses to high concentrations of acid7. Figure 1: Taste preference assay results. Some examples in the variation of abdominal coloring are shown. Dark red ingested (A). Light red ingested (B). Dark blue ingested (C). Light blue ingested (D). Purple abdomens are considered when the entire coloration appears purple (E), or when distinct regions of the abdomen show portions of red (arrowhead) and separate portions of blue (arrow) (F). Please click here to view a larger version of this figure. Figure 2: Controlling for food coloration effects. The addition of food coloring to the tastants should not have any effect on the animals' taste preference. Varying the concentration of blue dye while maintaining a constant concentration of red dye revealed an optimum combination of 1.3% red to 1.0% blue. This is indicated by a preference index value near 0.5. Values are the mean ± standard deviation. *p <0.05, ***p <0.001 from two-sided student's t-test. Please click here to view a larger version of this figure. Figure 3: The taste preference assay used for attraction and aversion. Drosophila are naturally attracted to high sucrose concentrations as seen by a preference index value near 1 when given the choice between 5 mM sucrose (in blue) and 1 mM sucrose (in red). Adding an aversive compound such as acid to the 5 mM sucrose option reverses this choice for high sucrose as the preference index drops to near 0. Values are the mean ± the standard deviation. ***p <0.0001 from two-sided student's t-test. Please click here to view a larger version of this figure. We have described a simple but effective protocol for determining taste preference in Drosophila. Versions of this assay are routinely used in experiments to determine the contributions of gustatory receptors (GRs) to perceiving the different qualities (bitter, sweet, sour, salty, and umami) of taste compounds. The Drosophila genome contains approximately 60 genes which encode 68 identified gustatory receptors by alternative splicing8,9. However, other proteins such as ionotropic glutamate receptors and TRP channels have also been demonstrated to play a role in taste10-13. 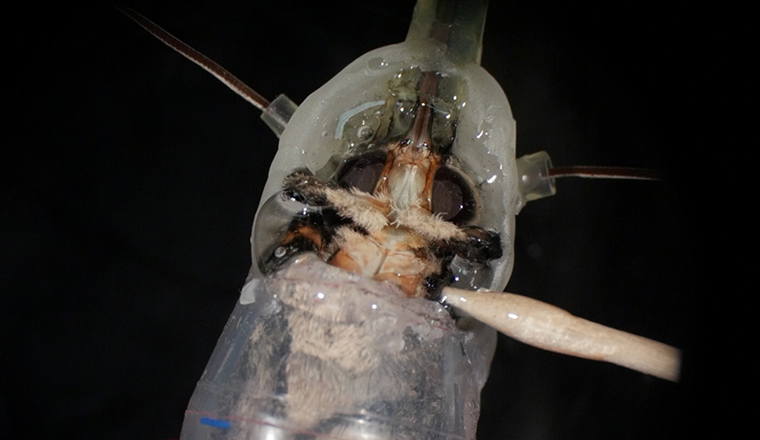 Therefore, there is extensive diversity in the discriminatory power of taste in insects. In addition, unlike receptors for smell, taste receptors are expressed in cells located all over the fly. Sensilla containing combinations of neurons expressing different taste receptors can be found on the labellum, legs, wings and ovipositer14. As such, Drosophila rely on taste discrimination for a host of behaviors beyond nutrition acquisition including courtship and egg laying. This taste analysis technique may be applied to address many different experimental questions. For example, since taste, courtship, and egg laying behaviors are important considerations for many animals, this protocol may be scalable to other important insects such as ticks and mosquitoes. Such advancement could prove useful for disease vector management and pesticide development. In addition, this assay could be scaled up for use in forward genetic screens which have made Drosophila such a powerful investigative tool for decades. The complete molecular understanding of taste pathways is not known. Identifying disruptions in novel genes which mediate taste preferences in this assay could assist in filling in important gaps in taste circuit knowledge. Moreover, as the importance of preclinical models of disease continues to increase, pharmacological screens affecting gustatory signaling mechanisms can easily be performed by adding therapeutic compounds to the tastants in this protocol. Therefore, the robust assay described here is a potentially valuable tool for many different lines of research. There are several advantages to using this protocol for analysis of taste preference. Early versions of this feeding paradigm utilized only a single color for detection of ingested tastants and popular current applications make use of microtitre plates for tastant delivery15-18. The Petri dish assay chamber used in this protocol is a somewhat common product found in laboratories not currently prepared to perform taste assays. The likelihood of having an assay chamber already on hand, therefore, helps facilitate testing of new hypotheses without time or money investment in new equipment. Also, the combination of using blue and red dyes is valuable to ensure that all the animals counted in the experiment actually participated in the experiment. Even after 24 hr of starvation, some healthy animals with clear abdomens following the feeding period may be seen. Eliminating these animals from the preference index calculation is necessary to ensure an accurate measurement of the population. In addition, after starvation some animals will invariably die before they are able to participate in the assay. While some dead animals may desiccate and can easily be removed before counting, other dead animals may be more difficult to identify. The inclusion of dye in both food choices therefore, ensures that only healthy animals which consumed a food source are considered for the experiment. This greatly reduces the variability of the results which can be seen in single color versions of this assay. In addition, the use of two colors also allows animals which feed on both substrates to be identified by the mixed purple coloration in their abdomens. These animals are important because they demonstrate that some individuals may have weaker preferences than the entire group. It should be noted that we have also had success using blue and yellow food dyes for this adult taste assay where animals feeding on both substrates exhibit green abdomens. In this context, we have found that the yellow abdomens are somewhat less obvious to score than red abdomens, but nevertheless some researchers may prefer this option. As with the colors used in this protocol, a proper balance of food dyes needs to be empirically determined to ensure the dyes do not have an effect on animals' preference. While this taste preference assay is good at determining how a population of flies responds to different tastants, it doesn't provide any information about single animal responses or actual food intake. Other assays that are commonly used for studying taste in Drosophila systems offer better resolution of these parameters19. Specifically, the proboscis extension assay is very useful for monitoring the actual behavioral response of single flies to drops of liquid food. Likewise a capillary feeding paradigm (CAFE) offers a robust means of assessing the quantity of ingested compounds in single flies, with the added advantage that the assay is able to easily be monitored over long periods of time. Another limitation of the population based taste assay here does lie in the somewhat subjective nature of the scoring. As illustrated in Figure 1 there is always some degree of variation in the amount of food consumed and/or excreted by each animal. Therefore the intensity of the abdominal color varies. It is good practice for researchers to score the animals while blind to the conditions of the plate. To accomplish this, it is recommended to avoid writing tastant identities on the plates but instead label the boxes the plates are placed in so that the plates can be counted in as unbiased a manner as possible. It is also prudent to confirm results by rotating the tastant of interest to alternate colors in separate experiments. This additional analysis should ensure robust accuracy of the results. We would like to thank members of the Tessier lab for critical reading of this manuscript and helpful suggestions during the preparation of this protocol. Herrero, P. Fruit fly behavior in response to chemosensory signals. Peptides. 38, (2), 228-237 (2012). Vosshall, L. B., Stocker, R. F. Molecular architecture of smell and taste in Drosophila. Annu Rev Neurosci. 30, 505-533 (2007). Harris, D. T., Kallman, B. R., Mullaney, B. C., Scott, K. Representations of Taste Modality in the Drosophila Brain. Neuron. 86, (6), 1449-1460 (2015). Hong, E. J., Wilson, R. I. Simultaneous encoding of odors by channels with diverse sensitivity to inhibition. Neuron. 85, (3), 573-589 (2015). Kain, P., Dahanukar, A. Secondary taste neurons that convey sweet taste and starvation in the Drosophila brain. Neuron. 85, (4), 819-832 (2015). Masek, P., Worden, K., Aso, Y., Rubin, G. M., Keene, A. C. A dopamine-modulated neural circuit regulating aversive taste memory in Drosophila. Curr Biol. 25, (11), 1535-1541 (2015). Charlu, S., Wisotsky, Z., Medina, A., Dahanukar, A. Acid sensing by sweet and bitter taste neurons in Drosophila melanogaster. Nat Commun. 4, 2042 (2013). Clyne, P. J., Warr, C. G., Carlson, J. R. Candidate taste receptors in Drosophila. Science. 287, (5459), 1830-1834 (2000). Scott, K., et al. A chemosensory gene family encoding candidate gustatory and olfactory receptors in Drosophila. Cell. 104, (5), 661-673 (2001). Kim, S. H., et al. Drosophila TRPA1 channel mediates chemical avoidance in gustatory receptor neurons. Proc Natl Acad Sci U S A. 107, (18), 8440-8445 (2010). Koh, T. W., et al. The Drosophila IR20a clade of ionotropic receptors are candidate taste and pheromone receptors. Neuron. 83, (4), 850-865 (2014). Zhang, Y. V., Ni, J., Montell, C. The molecular basis for attractive salt-taste coding in Drosophila. Science. 340, (6138), 1334-1338 (2013). Zhang, Y. V., Raghuwanshi, R. P., Shen, W. L., Montell, C. Food experience-induced taste desensitization modulated by the Drosophila TRPL channel. Nat Neurosci. 16, (10), 1468-1476 (2013). Rodrigues, V., Cheah, P. Y., Ray, K., Chia, W. malvolio, the Drosophila homologue of mouse NRAMP-1 (Bcg), is expressed in macrophages and in the nervous system and is required for normal taste behaviour. EMBO J. 14, (13), 3007-3020 (1995). Tanimura, T., Isono, K., Yamamoto, M. T. Taste sensitivity to trehalose and its alteration by gene dosage in Drosophila melanogaster. Genetics. 119, (2), 399-406 (1988). Weiss, L. A., Dahanukar, A., Kwon, J. Y., Banerjee, D., Carlson, J. R. The molecular and cellular basis of bitter taste in Drosophila. Neuron. 69, (2), 258-272 (2011). French, A. S., et al. Dual mechanism for bitter avoidance in Drosophila. J Neurosci. 35, (9), 3990-4004 (2015). Deshpande, S. A., et al. 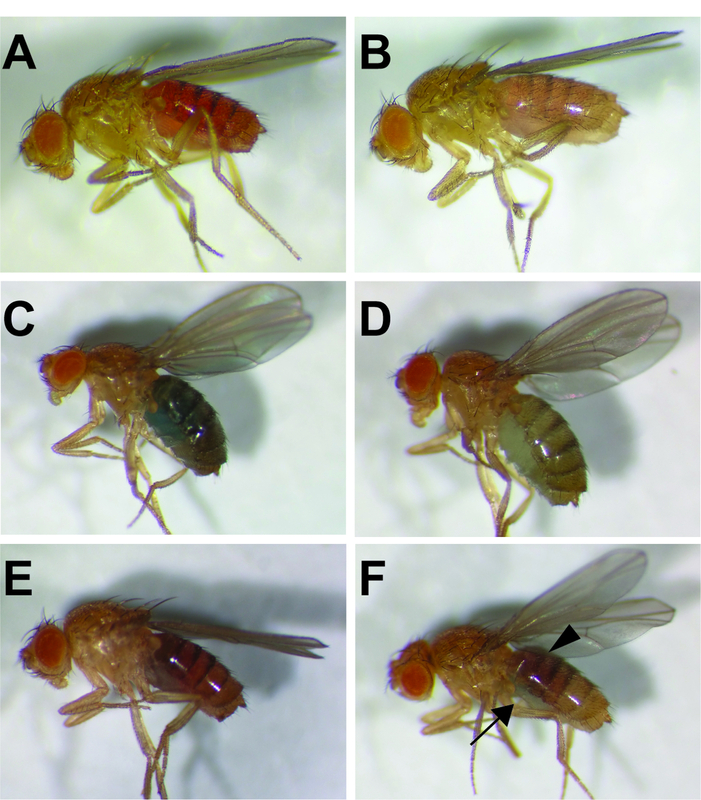 Quantifying Drosophila food intake: comparative analysis of current methodology. Nat Methods. 11, (5), 535-540 (2014).